R.J. Rushdoony: 00:00 Let me remind you again, our next meeting is on the 2nd of July. One thing more. First freedom. Let us begin with prayer. Almighty God, our heavenly Father, who of thy grace and mercy has made us thy people, has given us thy spirit that we may stand in terms of thy sovereign power, thy word, and in terms of thy kingdom, who come to thee joyfully again rejoicing in the power, the strength, and the freedom that is ours in Jesus Christ, our Lord. We pray, our Father, that thou would give us always courage, faith, and endurance as we face the onslaughts of humanism in our world of evil. In Jesus name, Amen. R.J. Rushdoony: 01:11 This evening we shall be dealing as we have previously with the doctrine of the state, or the theology of the state. We shall have three sessions this evening. We’ll try to keep each of them relatively brief so that we don’t continue too long. This first session, our subject is salvation and the state. As Charles Norris Cochrane in his exceptionally able study, Christianity and Classical Culture has shown, Augustine Rome began with the claim to represent an eternal order, to be eternal Rome. So that basic to the Roman Empire was the belief that it was a saving society, a saving state. R.J. Rushdoony: 05:38 Rome and the other states of the ancient world talked about the gods, but the gods were not important in their faith. The civil government was because man then looked not to the gods but to the state for salvation. There is a continuity between the gods and men, but the focal point in which deity, godhood, was manifested in the state, in this world, was in the state, either in the civil government itself so that the entire civil structure was divine, or in the rulers or in the office, but in some form or another divinity, godhood, was incarnate in civil government. Salvation was by the state, not by any god beyond this world. R.J. Rushdoony: 06:46 Tertullian raised the question as he appealed to the Romans asking why do you persecute us Christians? He called attention to the fact that we are the most law abiding people you have in your society. This is still true today. He called attention to the fact that they’re the most hardworking people, the better tax payers because they were honest. Rome’s greatest asset was the Christian and it was the Christian they were persecuting. Why? Because Tertullian said, we refuse to pay the required honors to the emperor. We pray for him, he said, but we cannot worship him. R.J. Rushdoony: 07:46 He went on to say, and I quote, “There is also another and a greater necessity for our offering prayer on behalf of the emperor, nay for the complete stability of the empire, and for Roman interests in general. For we know that a mighty shock impending over the whole earth, in fact the very end of all things threatening dreadful woes is only retarded by the continued existence of the Roman Empire. We have no desire then to be overtaken by these dire events and in praying that their coming may be delayed, we are lending our aid to Rome’s duration. More than this though, we decline to swear by the genei of Caesars, we swear by their safety, which is worth far more than all your genei. Are you aware that these genei are called demons, against the diminutive name demonia is applied to them? R.J. Rushdoony: 08:49 We respect the emperor’s … we respect in the emperors the ordinance of God, who has set them over the nations. We know that there is that in them which God has willed. Unto what God has willed, we desire all safety and we count an oath by it a grave oath, but it’s for demons, that is your genei. We have been in the habit of exorcizing them, not us swearing by them and thereby conferring on them divine honors. R.J. Rushdoony: 09:24 But dwell longer on the reverence than sacred respect of Christians the emperor, whom we cannot but look up to as [inaudible 00:09:33] office so that on valid grounds I might say Caesar is more ours than yours, for our God has appointed him. Therefore, as having this propriety in him, I do more than you for his welfare, not merely because I ask it of him who can give it or because I ask it as one who deserves to get it, but also because in keeping the majesty of Caesar within due limits and putting it under the most high and make it less than divine, I commend him more to the favor of deity to whom I make him alone inferior, but I place him in subjection to one I regard as more glorious than himself. R.J. Rushdoony: 10:18 Never will I call the emperor God and that either because it is not in me to be guilty of falsehood or that I dare not turn him into ridicule or that not even himself will desire to have that high name apply to him. If he is but a man, it is his interest as a man to give God his higher place. Let him think it enough to bear the name of emperor. That too is a great name of God’s giving. To call him God is to rob him of his title, for he is not a man emperor, he cannot be.” We, said Tertullian, are your best citizens. We are the only ones who pray for the emperor but we refuse to worship him. R.J. Rushdoony: 11:13 Rome persecuted the Christians not because they were trouble makers but because they threatened the religious foundation of Rome. For this same reason, the church is persecuted today because humanism is basic to the modern state and humanism cannot endure Christianity. R.J. Rushdoony: 11:40 Rome finally adopted Christianity only to strengthen itself, not to surrender to Christ. The Christians by declaring Christ the savior and Lord undercut the foundations of Rome. Hence, war between the two was inevitable. The Lordship of Christ meant that Christ alone is God and that he was Lord over Caesar. Christ the savior meant that the emperor could not be the savior. But in Roman theology, the emperor was both lord and savior and the coins of Rome so proclaimed him. R.J. Rushdoony: 12:27 The good character of the Christians thus only made them more a threat. After all, we prefer our enemies to have vices and weaknesses do we not? It makes them more vulnerable. The stronger the Christians were in faith, the more godly and honest they were as citizens, the more Rome hated them. It wanted to break them. It wanted to see the Christians whimper and disown their Lord and be dishonest because it could then write them off as it wrote off any other worthless person. R.J. Rushdoony: 13:18 The difference between what prevailed then and now is not very great. Today, the Christian schools are offensive to the state, not because they are bad but because they are good, because they are superior. This is their offense. This is why in trial after trial they bar testimony about the educational caliber of the Christian schools, about standardized testing and the like. The modern school of course is built on the premise that the state is the savior. This was the basic faith of Horace Mann, a unitarian, and all our public education today is patterned after the dream of Horace Mann, to substitute the public school for the state, for the church, to make the state man’s agency of salvation through the public school. R.J. Rushdoony: 14:31 It was in 1955 that Harold O. Rugg, one of the most important philosophers of education of this century declared that Uncle Sam should be, I quote, “Busy converting himself into Uncle Savior.” Harold Rugg stated it very openly. The state should make itself man’s savior. 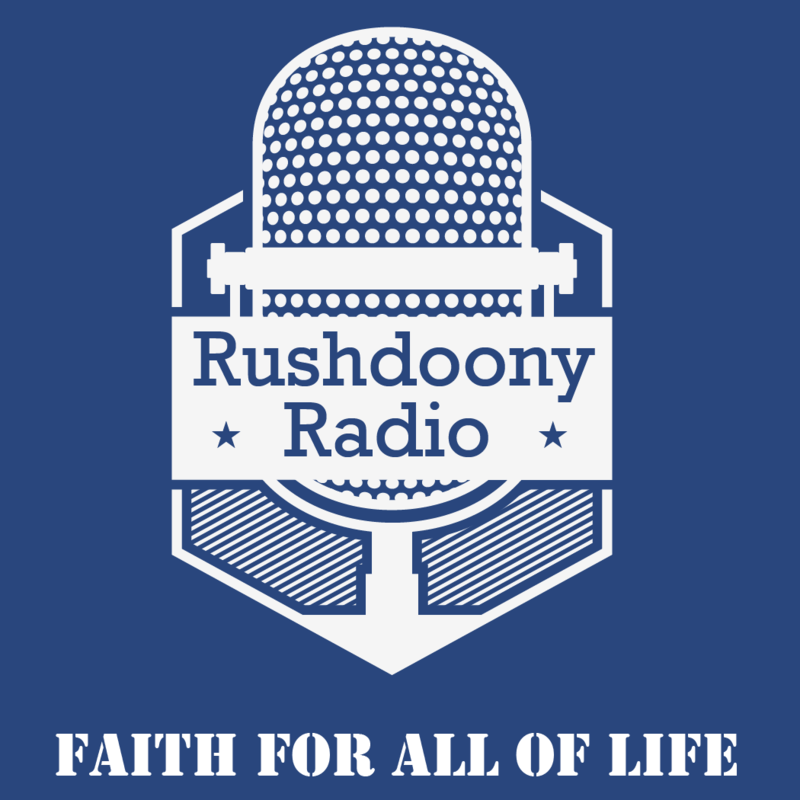 R.J. Rushdoony: 15:07 Salvation is a total concept. A savior has dominion and authority over every realm of life. A savior must be lord. He must be sovereign. Sovereign and lord are both the same words, just different forms of saying the same thing. The modern state claims sovereignty although our constitution was written without ever using that word, which the founders felt belonged to the Lord God of Hosts. R.J. Rushdoony: 15:42 But when a state claims sovereignty, it can tolerate no other savior. Sovereignty is a total concept, one who is lord must also be the savior or he is not lord. So because the modern state says emphatically we are sovereign, the modern state therefore declares we are the saviors. Bow down and worship us. R.J. Rushdoony: 16:22 Roman state and the modern state make a logical claim. By claiming sovereignty, they claim to be saviors. It is the modern Christian who is illogical. He limits salvation to the soul and quickly loses it. We have had a school of theology since World War 2 that says Christ is not the savior until the rapture … the Lord until the rapture comes. Now he’s only the savior. Somewhere in the future he will be the Lord. When you deny the lordship here and now, you deny his saving power. Only a lord can be a savior. Hence, the confession of faith that the early church was Jesus Christ is Lord, salvation belongs not to the state but to Christ alone. R.J. Rushdoony: 17:28 Are there any questions now before we proceed to our second subject of the evening? No questions.